We Impress Blinds are offering the values and personal touch in the form of best windw covering solutions that only be supplied by experienced company in Luton and overall UK. Adding window blinds is the best way to enhance the beauty of a room while making it more comfortable and having full light comtrol. 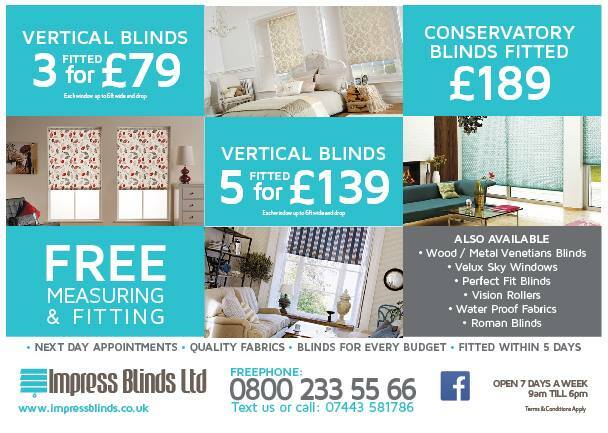 So, explore our gallery of quality window blinds that are available in a wide range of fabrics, designs, textures and patterns by booking in for a free measure up. From elegant soft textures to stunning bold colors, we have an amazing spectrum of made to measure blinds. Ranging from vertical blinds to roman blinds, roller blinds, velux blinds to conservatory blinds, we’ve a wide collection of window blinds that are ideal for both domestic and commercial premises. Having significant experience in the blind and shade industry, we’re successfully delivering the very best of products and services to all our clients in Luton Bedfordshire areas and across UK. We’re committed to providing the exceptional blind products and services in timely and cost effective manner. Our UK made blinds are easy to clean, manage and operate. We supply and install made to measure blinds that fit the exact specification of your windows, ensuring you full peace of mind. In addition to it, we also offer free measuring and fitting services to all our clients in Luton Bedfordfordshire areas and throughout UK.